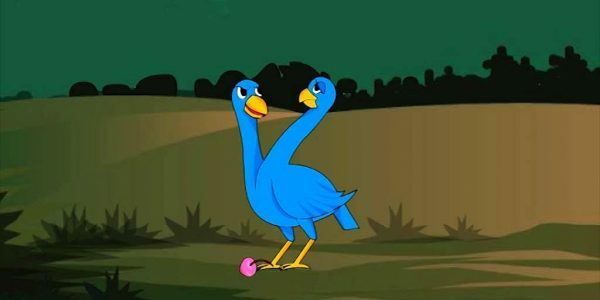 Once upon a time there lived a bird with 2 heads. It was a strange bird. It had one stomach, which balanced, on the same pair of legs but on top it divided into 2 necks, which ended in 2 heads. One day as the bird was walking along one of the heads saw some delicious fruit lying on the ground. The head began to eat the fruit all the while commenting on how good it was, how tasty, how utterly divine, oh it was amazing! It almost seemed as though with every bite the fruit became tastier. The other head said ‘if it is that good won’t you please share some with me too? After all we share the same body, we are really one person’. But the first head would not allow the second head to get anywhere near the fruit. It kept twisting around and saying ‘oh don’t worry you will have the benefit of it when it reaches our stomach. If we are the same person then we don’t both need to have it.’ And no matter how much the other head asked the first head would not let him taste any of the fruit. The second head was furious and waited for chance to pay the other one back. The next day as they were walking along the second head saw some deadly poison on the ground and decided to eat it. The first head tried its best to stop him – ‘don’t do it, it’ll kill us! This is not right. We share the same body, you don’t have the right to eat things without my agreement’ etc. But the second head would not listen and it ate the poison and killed both the heads. Your ego will bring you down. This is part of the Self-Management Competency. Being emotionally intelligent is crucial to being a good leader and manager. Emotional intelligence affects us all, whether we are working in collaboration with others or individually on projects. With greater self- awareness of their emotions and the ability to empathise and understand other people’s emotional state, you will perform better in the community. In other words being emotionally intelligent makes a real difference to performance and, therefore, profit. Emotional intelligence is not just a desirable ‘soft skill’. In fact, research indicates that emotional intelligence can be a better indicator of workplace performance than IQ. How do you react to cut throat competition? I would first appreciate the contribution made by every team member here. First, to the cut throat competition, It leads to nothing but an ultimate destruction to everyone. I personally feel that a friendly competition is a healthy competition. The vulture, lion and boar can team-up and find a prey and have an equal share among them. The contribution from each member is essential here. Secondly, regarding the bird with two heads, it depends on the individual perspective. for example, A wolf catches a child as a prey. As civilized humans, we deny this action but if we look from the wolf’s perspective it is absolutely correct. Being all this said, I consider revenge is digging their own grave.